The AccelaFrame Canopy assembles quickly and easily in 15 minutes. The Evolution of the Canopy - Featuring the strength of a pipe canopy with the speed of a pop-up. The new AccelaFrame Canopy provides 200 sq. ft. of shade and shelter in 15 minutes! Featuring the innovative quick assembly system, this canopy has fewer loose parts and can be erected and disassembled quickly and easily. It's the perfect combination of strength and ease of assembly whether on the job site, camping with the family, or at the next farmers market. This revolutionary patent-pending technology is the accelerated shade solution for the on-the-go lifestyle! Innovative accelaframe system - engineered for quicker assembly and disassembly, frame strength, and easy storage. QUICK AND EASY SET-UP - 200 sq. ft. of shade assembled in less than 15 minutes with less loose parts in the box. LOCKING PIN SYSTEM - Keeps pipes secured together increasing stability. HIGH GRADE STEEL FRAME - Sturdy 1 3/8 in. / 34 mm diameter steel construction with a premium powder coat finish resists chipping, peeling, rust and corrosion. RIPSTOP TOUGH FABRIC COVER - 5 oz./m2 triple-layer woven polyethylene is heat sealed for a waterproof cover. UV treated inside, outside, and in between with added fade blockers. ROCK SOLID BASE - Integrated foot pads on every leg ensure a stable frame and easy access to secure anchoring. Properly secure tent garages, storage buildings, canopies, sheds and shelters with ShelterAuger Earth Anchors. These heavy-duty steel 30-inch rods are fashioned with corkscrew spirals to more easily spin through the ground and provide strong tethering once in place. This set includes four ShelterAugers and four clamp-on wire tie-downs to secure your structure to the eyehole on each rod. The ShelterLogic 10 x 10 Open Top Pro Pop Up provides portable instant shade and protection anytime and anywhere. The 10 x 10 straight leg open top frame is built with high-grade, sturdy tubular steel and its polyester cover is treated to withstand the outdoor elements for lasting quality. The foot pads are wide to ensure a solid base and offer easy access for securing anchors, providing added stability. The Pop Up Pro is the perfect shade solution for sporting events, backyard or special events, tailgating, camping or commercial use. AccelaFrame Canopy 10 x 20 ft. The AccelaFrame Canopy assembles quickly and easily in 15 minutes. The Evolution of the Canopy - Featuring the strength of a pipe canopy with the speed of a pop-up. The new AccelaFrame Canopy provides 200 sq. ft. of shade and shelter in 15 minutes! Featuring the innovative quick assembly system, this canopy has fewer loose parts and can be erected and disassembled quickly and easily. It's the perfect combination of strength and ease of assembly whether on the job site, camping with the family, or at the next farmers market. This revolutionary patent-pending technology is the accelerated shade solution for the on-the-go lifestyle! 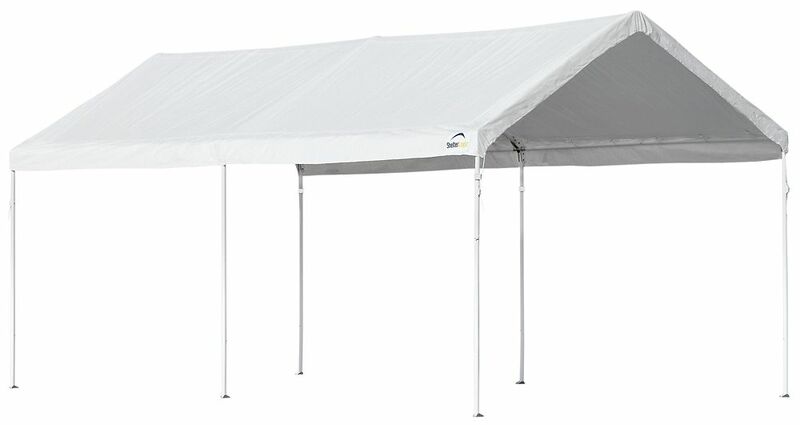 AccelaFrame Canopy 10 x 20 ft. is rated 3.7 out of 5 by 9. Rated 5 out of 5 by Troop 1707 from Great product, super fast setup Our Boy Scout Troop has two of these. They have held up well even in high winds. We used dog chain screws and ratchet straps to secure it. They go up so fast. We will most likley buy a few more. Rated 2 out of 5 by Dotson from Not strong I had this canopy up for less than a week and one storm came through and bent two of the legs in half. It looks nice and that's the only reason it got two stars. Had I known a storm was going to pop up out of nowhere, I would have taken it down. I just wasted a good bit of money, will not buy again. Rated 4 out of 5 by grumpy from ease of assembly and craftsmanship is great looked at reviews and videos, decided to purchase and glad i did. the only downside is the tarp itself, i'm not sure but don't know how long it will last in the fla. weather. Rated 5 out of 5 by Big T from Good and sturdy Set up takes two (third doesn't hurt) about 1/2 hour. Very sturdy one the canopy is stretched over the top and secured. Leg height does not adjust so it will probably be troublesome on a steep incline. Used it to cover the food during a church picnic we hosted at our house. Will pay for itself after the second use. Saved the box, put the pieces back in and tied some rope around it for handles when carrying it. Takes two to carry comfortably. Rated 5 out of 5 by Emmanuel from Great Product We used this in the park at our church's cookout and there was a big rain and wind storm at the end but it withstood the storm and nothing was broken. Heavy but sturdy.